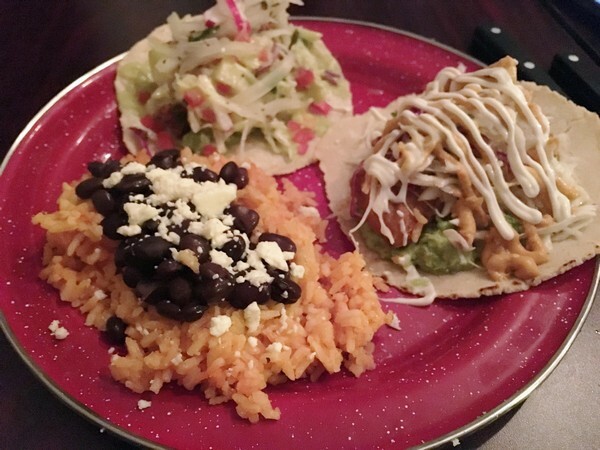 Always on the prowl for good Mexican food, the Accidental Locavore was quick to pick up on the rumors that there was a good new one, Modern Taco, in nearby Red Hook (Rhinebeck’s shyer sister). An added bonus was that we knew the chef/owner Mark Brocchetti, the chef from our golf course dining room, back when the food was enjoyable, interesting and made by someone who cared. With my friend Laura in tow, we arrived one Saturday night to check it out. It’s a charming room, with Mexican touches, that reflect Mark and his partner’s take on Mexican food. Luckily he has no fear of venturing off the taco, burrito and enchilada trail that is actually more TexMex than anything you might actually eat south of the border. No gloppy refried beans here. When beans appear they’re in a slightly spicy black bean soup with crema drizzled on the top that’s better than any other black bean soup I’ve had in a long time. 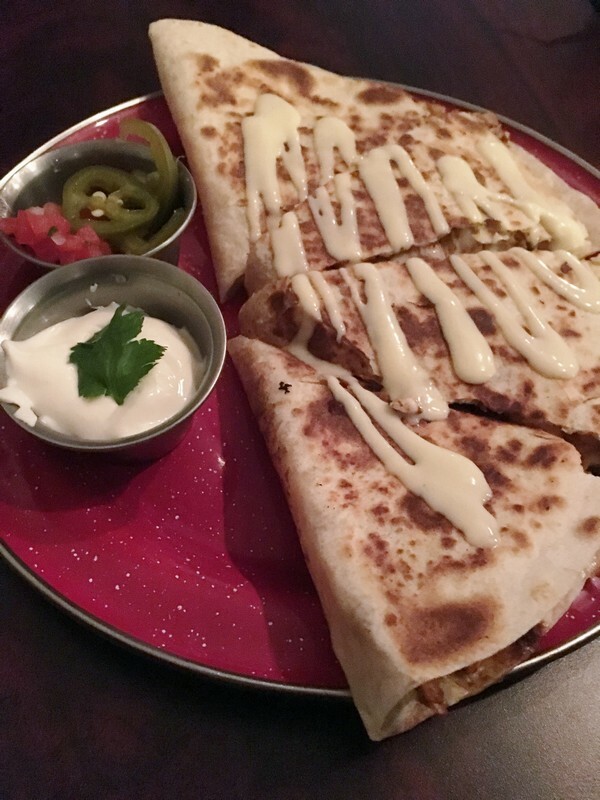 That night the special – a rabbit quesadilla with a mole sauce – was right up my alley. The rabbit was nice and tender and the mole sauce was good. A little bit more of the sauce would have been nice, and it could have taken a bit more heat (however, if you’re not a spicy person, this is one of the milder dishes). Another special was what Mark calls Mexican breakfast. If it’s not on the menu when you’re there, beg. 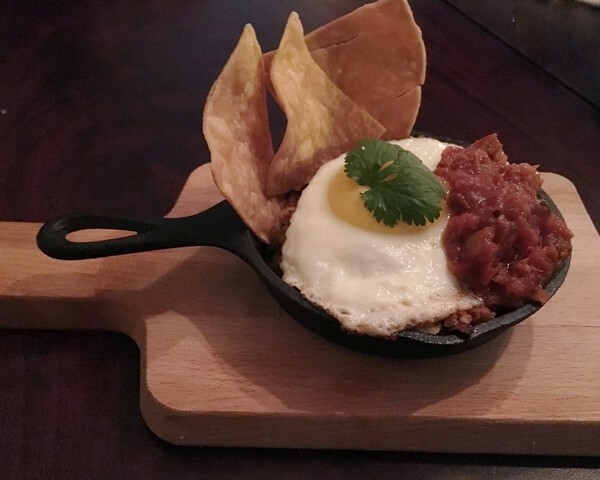 It’s a great mix of chorizo, potatoes and caramelized onions with a fried egg on top, served in a cute little cast iron skillet. 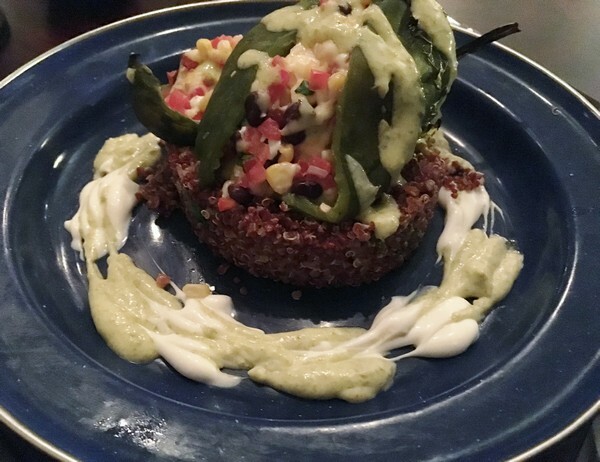 Laura was thrilled with the stuffed poblano with quinoa, tomato and corn, resting in a great poblano cream sauce. It’s a great vegetarian option. Working his way through the taco menu, Frank chose the fish taco and a fried avocado taco (because we were all curious about the fried avocado). These are soft tacos, crammed with filling, just like you would get in any taqueria in Mexico. The fish was really good, but the fried avocado wasn’t my favorite. In fairness to Mark, it may just be that I don’t love cooked avocado – I’ve grilled them and don’t think it’s worth the effort. Even though we were stuffed to the gills, Frank and I happily worked our way through the chocolate pot de crème, spiked with habanero. If you’re not familiar with pot de crème, it’s essentially a cousin of chocolate mousse. Creamy and rich, this had a subtle kick from the habanero. A week later, we were back with two other friends. Once again I opted for the special, that night a duck quesadilla. Our friends went for the steak and the chicken quesadillas so we got to taste all three. Everyone’s favorite was the spice-rubbed duck with the steak a close second. Frank went for two other tacos, the pulled pork and the shrimp, both of which were really good. If I were choosing from the ones we’ve tried, it would probably be the pulled pork and the fish. The guacamole is good, but might be weird for Americans used to a chunky version. This one is truer to its taqueria roots, smooth and creamy and good with the freshly fried chips. The roasted salsa is a great choice as is the pico de gallo – fresh with good (I don’t know where he got them in December) tomatoes, cilantro and a touch of lime. Modern Taco is open Thursday through Monday for dinner only. Lunch is promised for the summer. Enjoy!